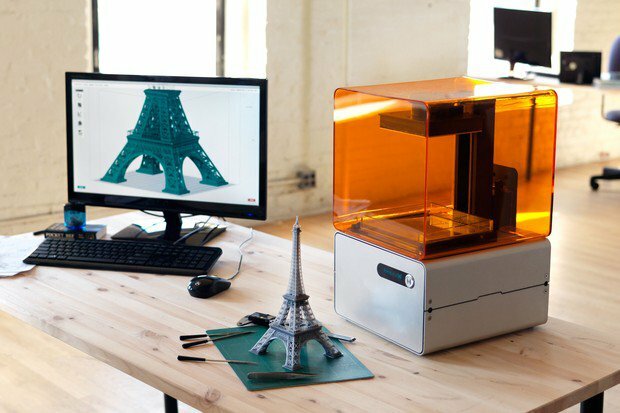 While printing, the Form 1 is whisper quiet — it can sit unobtrusively on your desk. It does, however, make a few unique sounds — particularly when starting a print. Many of you have wondered what these sounds are. To give you a better idea of what’s going on inside of your Form 1, we’ve recorded a machine as it starts up and gets ready to print. Button click - Power on [0:00]: A single button click wakes up the Form 1. Motor hum and click - Resin tank reset [0:02]: To initialize the position of the resin tank, the peel motor first drives the resin tank up to the horizontal position. The clicks, caused by the motor overdriving the tank carrier up, ensure the tank is in the proper position. Lower pitched motor - Resin tank peel [0:08]: The peel motor then drives the resin tank down to the tilted position to ensure the build platform and any cured parts can be safely lifted out of the resin without damaging the tank or silicone. Motor hum - Build platform reset [0:17]: The Z-motor drives the build platform up to the top of the tower, moving it clear of the resin tank, so that the build platform can be easily removed. Motor hum and click - Resin tank reset [0:19]: The peel motor resets the resin tank to the horizontal position so that the tank can be refilled or removed. The Form 1 is now ready to print. Of course, once we made the recording, inspiration struck. One of our engineers, Adam, couldn’t resist creating Form 1 (The Remix). Dim the lights and start grooving. We've also added an article to our growing storehouse of online documentation.